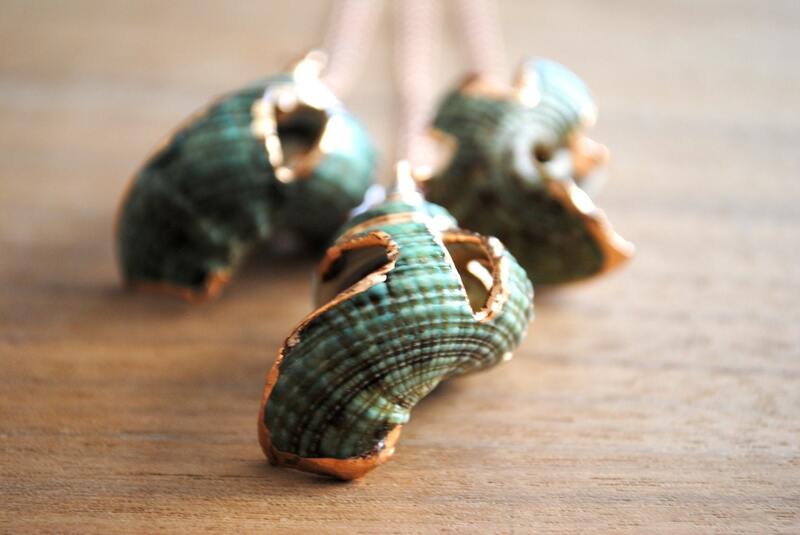 Rose Gold Shell Necklace. Rose Gold Turbo Shell Necklace. Rose Gold Plated Necklace. Rose Gold Filled Chain. Green Shell. Mermaid Necklace. ⊿⊿ This necklace features a beautiful green turbo spiral shell that has been plated in rose gold and it hangs from a delicate 18" genuine rose gold filled chain. It closes with a spring ring. No extender is available and this is the only length it comes in. ⊿⊿ These lightweight shells are all natural and feature a beautiful green color (actual color will vary from the colors on your screen). The abandoned shell comes from a sea snail who typically lives in shallow water of tropical and sub-tropical regions. ⊿⊿ I have several of these available. Refer to the second to last image and make your selection at check out. The pendants measure about 1 1/4" in length and 3/4" in width and each is unique and one of a kind and will feature natural variations and imperfections - all organic to the raw nature of the shell. Rose Gold Abalone Necklace. Rose Gold Shell Necklace. Rose Gold Plated Necklace. Rose Gold Filled Chain. Green Abalone. Mermaid Necklace.